This is a healthy remake of a classic favorite. Many family recipes can be updated with some healthy substitutions and a watchful eye on portions! Keep in mind healthy substitutions when baking — non-fat milk, egg whites, and applesauce in place of oil...you'll be amazed at the results! 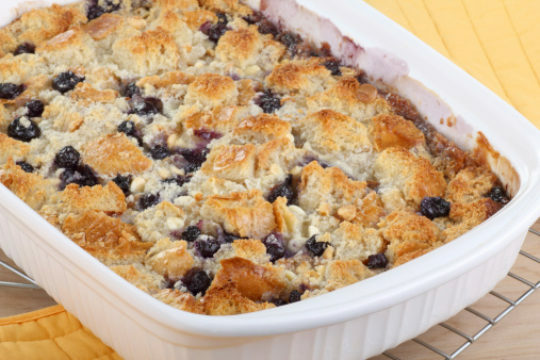 Combine blueberries and lemon juice in a baking dish coated with cooking spray, stir. Combine flour, sugar, baking powder, nutmeg and salt into bowl, make a well in center. Combine oil, vanilla, and egg whites, stir with a whisk. Add to flour mixture, stirring until moist. Drop dough by spoonfuls onto blueberry mixture to form 8 dumplings. Combine 3 tsp sugar and cinnamon and sprinkle over dumplings. Bake at 350 for 30 minutes, until filling is bubbly and dumplings are lightly browned.